A ghost ship was discovered in the Italian waters near the shore. Coastguards spotted a double-mast 22-meter sailing ship cruising around near the Porto Rotondo resort but not giving any signs of life. The vessel had no name and no flags. It also appeared to be free of any crew members, or any living thing at all for that matter. To add to the mystery Italian media sources reported that ships of this kind are not registered anywhere in Sardinia. And besides, no one has seen anything like it in all Italy. 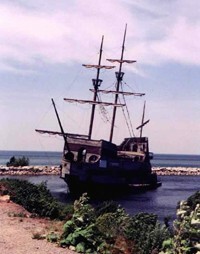 The ship’s appearances point to the fact that it is very old but it seems to maintain ideal condition nonetheless. However, there is no indication that anyone had tried to rebuild the ship.